Max Rectangular Capacity At 90°: 9" X 9"
Max Round Capacity At 90°: 9"
Max Square Capacity At 90°: 9"
Blade Size: 1" X 9' x 9"
Machine Dimensions: 61" X 63 X 67"
Cast Iron Shuttle Features Automatic Multi-Indexing Up To 19” In A Single Stroke With Automatic Kerf Compensation. Powered By Ball Screw And Stepper Motor. Steel Guide Arms. The Idler Side Guide Arm Is Mechanically Connected To The Front Vise Moveable Jaw For Proper Guide Arm Spacing At All Times. Automatic PLC, Touch Screen Control Programmable Up To 10 Jobs With 5 In Queue. 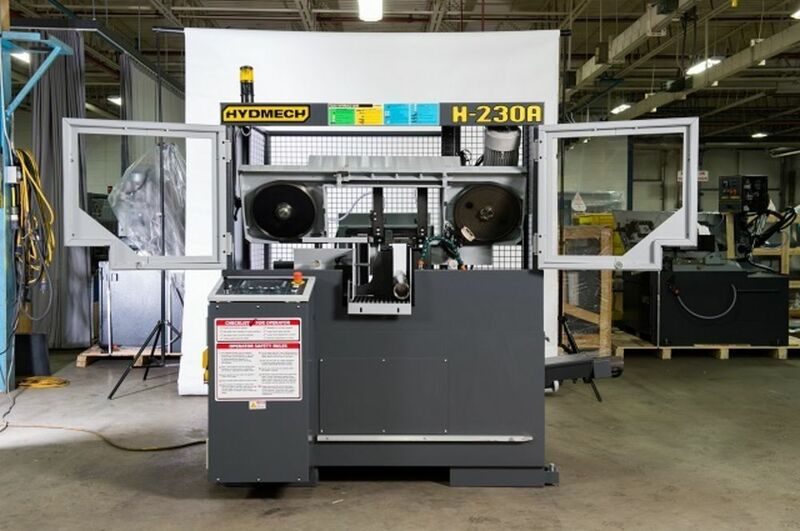 The H-230A Has The Smallest Footprint of HYDMECH’s Automatic Horizontal Band Saws. It’s Split Front Vise For Material Clamping Results In Less Burr On Cut Pieces. The Machines Controller Can Be Easily Programmed, Storing Up To 10 Different Cutting Jobs With 5 In Queue And Features Several Different Cutting Modes. Equipped With A Shuttle Feed, Its Shuttle Vise Assembly Is Capable Of High Speed Material Indexing Up To 19” In A Single Stroke. Driven By A Stepper Motor Controlled By A Ball Screw Assembly, The H-230A Provides Quick, Accurate Cuts. Featuring A 9″H x 9″W Capacity, 3 HP Motor, And 1″ Blade, The H-230A Is A Reliable Choice For Your Horizontal Cutting Applications.